Apparently, our productivity as employees has been plummeting since the mid 70s. Yes, indeed, you are reading it right, since the mid 70s! And yet we seem to be working more hours nowadays than ever before with a rather horrifying effect on us all for that matter. Yet, productivity still is very weak and we don’t seem to succeed in figuring out who (or what) is to blame for that. We just keep working hard, to the extenuation, having fully embraced the Cult of Busyness as if there is no tomorrow, well, because, you know, there won’t be a tomorrow anyway, if we all go on like this claiming we are just too busy doing things, while, at one point in time, sooner rather than later, we are all very aware we are bound to collapse. Is there hope for us? Can we help redefine productivity for us all, once more, and, more interestingly, can we rely on technology, specially, AI, to help us out in that daunting task at hand? I think we can, I think we will, although not necessarily through Artificial Intelligence but more along the lines of Assisted Intelligence. 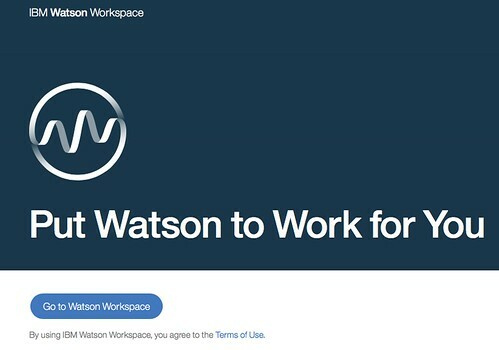 Welcome to the wonderful brave new world of IBM’s Watson Workspace! If you look out there, and read carefully, you would notice how vast majority of people keep saying how AI (newest shiny object out there in the tech scene at the moment) is going to save us all from almost everything. Perhaps even ourselves! The thing is that I have always been a bit concerned about the specific role we seem to have placed upon AI to come to our rescue and solve all of our societal / business problems, even to the point of replacing our very own decision making processes, therefore becoming the new managers. Yet, when I come to look a bit closer and observe how most AI has been applied through algorithms into some of the media tools I rely on I despair, and more and more by the day, frankly. All of a sudden we see how our overall user experiences are bastardised when an algorithm starts acting on behalf of us, the individual human beings, assuming they know better than we do what we really want, what our needs may well be and what our decision making process should have been like without even bothering about figuring out our context in the first place. It’s horrifying. Not necessarily because of the potential implications, but more than anything else because of the overall horrendous user experience they provide. It’s one of the main reasons as to why I deleted my Facebook account, my LinkedIn and my Google Plus Profiles; why I use Tweetbot everywhere vs. the regular Twitter Web site; why I have gone from the state of loving Instagram to loathing it more and more by the day; why every time there is a new media tool out there that comes with an algorithm I keep running away from it like the plague. I don’t want AI to decide for me what’s best, or not, for me. I don’t want AI to make me dumber by sacrificing my own privacy in exchange of convenience. You see? I don’t think that’s the role to explore the huge potential AI has got to offer in today’s world. If anything, I would want AI to make me better, smarter, and, overall, a much more effective decision maker, so that instead of replacing me and obliterating my entire thinking process, it can augment it helping me become more aware, more conscious, tolerant, diverse, empathic, caring and, overall, a better human being as a result. Now, that’s what humanising AI should be all about, if you ask me, which is why I’m so incredibly excited about IBM’s announcement, from earlier on this week, at the World of Watson conference event, where Watson Workspace was officially launched as a pre-view beta of what the future of collaboration, knowledge sharing, learning and innovating around knowledge should be all about. Not replacing and wiping out entirely our human potential, but, instead, augmenting our capability through enhanced, trustworthy and advisory commentary from IBM Watson itself. Welcome to the amazingly exciting world of Assisted Intelligence! 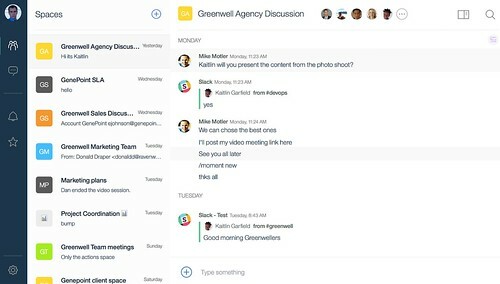 Earlier on this week, IBM announced a new product called Watson Workspace coming into play in an already rather crowded space, that is, the one around Messaging / Chatting apps with plenty of already rather solid products available like Slack, HipChat, Microsoft Teams, Spark, Circuit, RingCentral, TalkSpirit, Ryver, HiBox, Telegram, etc. etc. The list goes on and on and on. You may say they may well be a bit too late into the market, but then again no-one ever said that when Google first introduced Google Search over 15 years ago. It wasn’t the first search engine coming into the market, it wasn’t the last one either, indeed, but it transformed the way we use the Web today. 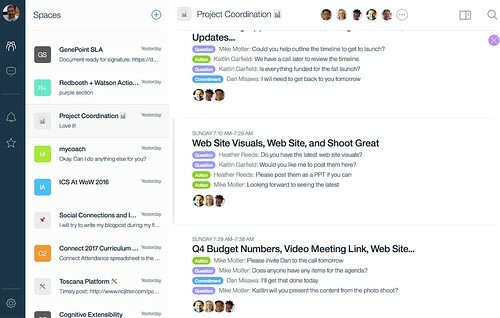 If you had a chance to view and participate in its live launch or if, instead, you have been playing with it already for the last couple of days or some more, Watson Workspace, that is, you will know it’s still very much in pre-view beta status, because plenty of the key basic capabilities from vast majority of messaging and chatting apps are still missing from the product itself, which, you may say, it’s a bit of a pity, but then again I am certain all of those standard features will come to par in a matter of weeks, if not days. Then what? Well, that’s when the fun truly kicks in, because what Workspace has got to offer is rather unique on its own, at least, that I know of. As a starting point, we will have Watson Work Services, which means that it will provide an opportunity to be integrated with almost everything that’s out there that would want to tinker around with its open APIs. And then there is IBM Watson itself through a superb new capability called Moments, which is, by far, what excites me the most about the application itself. Moments can best be described as, essentially, Assisted Intelligence at hard work with you and therefore helping me become smarter at what I do with what I know, without having to work harder unnecessarily. Moments is that brilliant new capability of applying cognitive computing to the way you collaborate by making your decision process much more effective keeping in your know of what’s happening while you are there, or even when you are not there. It will summarise interactions and conversations already held for you, present you with options on what you may, or may not, need to do to complete a certain ask or request, and eventually reduce all of the potential friction and clutter as to who does what, when, with whom and for what purpose. Now, not sure what you would think about it, but that’s not only what I would call the Future of Work, but the brilliant and exciting #PresentOfWork, frankly, and I just can’t wait for Workspace to unleash its full potential by demonstrating, in a very capable manner, it is very possible to turn Artificial Intelligence into Assisted Intelligence, to no longer think about replacing the human(s) when doing (collaborative) work, but to realise the full potential of the human intellect by enhancing the way we share our knowledge across and how we collaborate to get work done more effectively, which is, eventually, what productivity has been about all along either as an individual or collective activity. WoW, I am really excited about Workspace’s present, never mind its bright future! And you? Hi Julie, thanks a lot for reaching out and for the info request. I have now used the email address you have signed up to leave the above comment and you should receive the invite as we speak to check out the main space for conversations and discussions around Watson Workspace itself. Please do let me know if you didn’t receive the invite and I will take a look. Remember as well that Watson Workspace is in pre-view beta status, so plenty of the functionality you would expect as a KM and Comms system may not be there just yet, as we may need to wait for a few more days / weeks, but you can see already some of its capabilities and you could explore the potential with what’s already there, which is really cool! We’re also excited and you put the focus on Moments… That’s what could make Watson Workspace different from the others. Let’s see how it develops and if also the IBM business partners understand the concept. We already hear a lot of complaints around like.. how does it fit with connections? How to integrate, where do we earn money with it etc.. Wrong approach in my eyes..
Hi Sigi, many thanks for dropping by and for the great comments! Greatly appreciated. I am not surprised about the kind of feedback you are hearing about and the commentary you are getting across the board. I, too, have heard about those concerns, and I would say it’s a natural path of trying to figure out how to position it and what will be happening next with it. It’s still very much pre-view beta, so having an answer for all of those questions is a bit too early, I am afraid. I suspect we will have to wait till around January or February next year (Most definitely the IBM Connect event in San Francisco) for the real thing to come along and show us the reality it will be by then. For now, it’s pretty much a new kid on the block, still in the making, but with a huge potential already to help improve the way teams connect, share and learn what they are working on and with Watson chiming in as being part of the team it just doesn’t get any better than that, in my books, more than anything else, because, finally, we will be able to see Assisted Intelligence coming into play in the knowledge sharing and collaborative space, and that’s a much needed opportunity to help us all work smarter, without having to keep suffering from all of the clutter and noise out there that typically happens in teams.